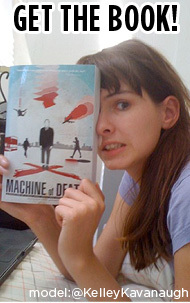 Machine of Death » New Review! And ebooks are now only $5.99! New Review! And ebooks are now only $5.99! The online science-fiction magazine Strange Horizons has a wonderful review of our book up today. It has some very nice (and specific) things to say about many of our writers, including Camille Alexa, Tom Francis, John Chernega, Julia Wainwright, Jeff Stuatz, Erin McKean, Shaenon K. Garrity, J. Unrau, Jeffrey C. Wright, Daliso Chaponda, and David Malki ! If it’s cheap, sadistic thrills you crave you’d do better to let Machine of Death alone and catch up on your Jersey Shore—but if you’d like to think as well as be mightily entertained, you’re in the right place. Also: All ebooks are now only $5.99! In other news, some folks have already noticed that our ebooks are now cheaper than they used to be. We’ve temporarily dropped the prices on all of our ebooks from $9.99 to $5.99. The reason for the price drop is tied to the mysterious countdown that David announced a few days ago, but I’m not going to spill the beans about that yet. There will be more information coming on that very soon! 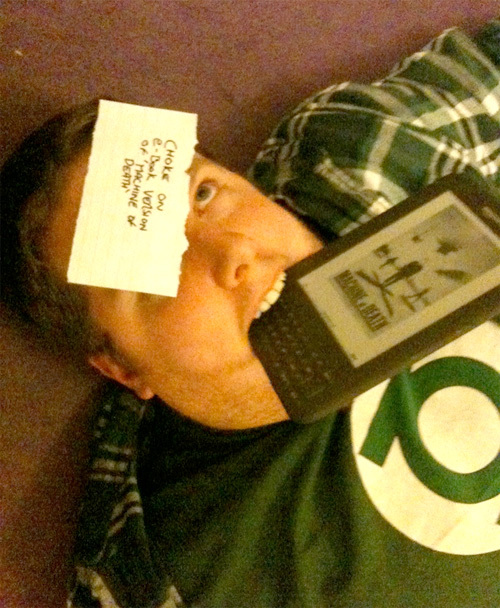 You can also get the ebook on Goodreads and read it in their ereader. We’re still waiting for Google Books to finish “processing” our file, but we hope that soon you’ll be able to read it there too. EDIT: I almost forgot! As always, we still have the free PDF as well, but the price hasn’t changed on that. We don’t always post full blog posts when we have little snippets of news, but we do sometimes put them up on our Facebook page. Our Facebook fans recently got to see some glimpses of new things we’ve been working on like this and this. We also ask for feedback sometimes on how we can do things even more awesomely. So visit our Facebook page and be sure to “like” us! We are likable people, at our core. It is nice of Facebook to notice this. Comments Off on New Review! And ebooks are now only $5.99!